LOUISVILLE – The Presbyterian Mission Agency Board (PMAB) will soon hold its first meeting since the 223rd General Assembly (2018), with new leadership at the helm. The Revs. Joe Morrow, PMAB chair, and Warren Lesane, chair-elect, along with the Rev. Dr. Diane Moffett, the newly elected president and executive director of the Presbyterian Mission Agency (PMA), will lead the board through their first meeting in Louisville on Sept. 27–29. In addition to Morrow, Lesane and Moffett, Ruling Elder Vilmarie Cintrón-Olivieri and the Rev. Cindy Kohlmann, the newly elected co-moderators of the 223rd General Assembly, will bring greetings along with General Assembly Stated Clerk the Rev. Dr. J. Herbert Nelson, II. Fulfilling the 223rd General Assembly mandate related to the Doctrine of Discovery, the September meeting will begin with a Native American tradition of acknowledging those whose land the group is meeting on and with a welcome from indigenous people currently living on the land. According to the mandate, this practice is to take place with all agencies of the Presbyterian Church (U.S.A.). The September meeting will also be the first one since the General Assembly where corporate matters will be separate from the work of the Mission Agency. This meeting will focus solely on mission. 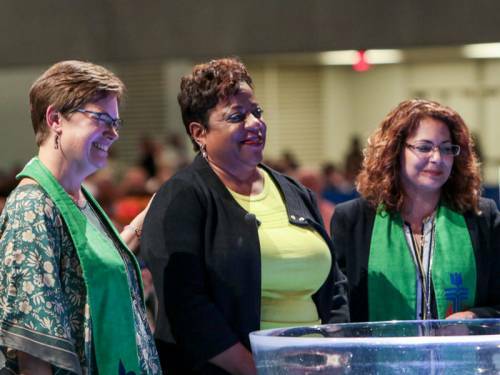 On Thursday, Sept. 27, the board will hold community conversations around the PMA Mission Work Plan emphases: poverty, where the denomination fights unjust economic systems perpetuating destitution and need; structural racism/white supremacy, where Presbyterians dismantle structures and ideologies oppressing people of color; and congregational vitality, where churches prioritize faithfulness over self-sufficiency. Another mandate being fulfilled at this board meeting will be the PMAB’s decision to conduct cultural humility training at each of its meetings. To help board members better understand and recognize the subtleties of these issues, Denise Anderson, coordinator for racial and intercultural justice for the PMA and co-moderator of the 222nd General Assembly (2016), will conduct the training session. Board members will also be presented with a recommendation for a revised committee structure. The recommendation is for all board committees to be included in one of two categories — programs and administrative. There will also be a recommendation to dissolve the audit committee, since the PMAB no longer has responsibility for the organization’s audit, and replace it with the mid council committee. Other program committees will include Nurture the Body and Outreach to the World. The administrative committees will include Personnel and Nominating, Property and Legal, and Resource Allocation and Stewardship. All PMAB members will serve on one program and one administrative committee. Another community conversation to be held on Saturday will be Finding Your Why. Simon Sinek’s book Find Your Why helps readers identify and understand why their organizations do what they do. Moffett says she is convinced that it is not just what we do, but why we do it, that gives us passion and makes our work meaningful for us and those who benefit from our labor. The PMAB meeting will wrap up on Sept. 29 with reports from the Administrative and Program Committees and Ministerial Teams/Task Forces.